The day I learned how to roast a chicken, I officially knew that I had become a woman. Actually, that's not true...What really defines when one becomes a woman? Let's not go there shall we? I knew that I had to do some major research, practice it, and learn how to cook the darn food or else my husband was seriously going to have 3 bowls of cereal every night after dinner. Now, instead of cocoa pebbles after a plate of dry chicken doused is sauce to mask its taste, he is eating the food I make. Well, not everything but it's a start. Start with a whole uncooked chicken. I always try and buy natural/organic meat. If I can, I buy local. It is more expensive than non organic meat, but it taste better I promise! Also, we don't buy meat that often so we can splurge a little on the good stuff. Before prepping the chicken, I always set up my station. 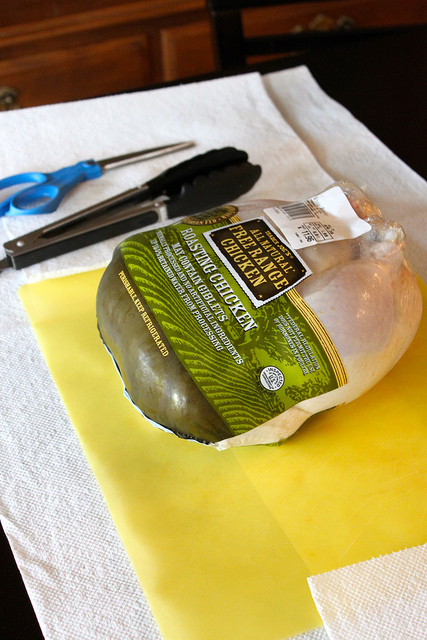 I place paper towel around the chicken, and a non-absorbant cutting board underneath. I also grab a pair of scissors and some claws. Are they called claws, I dunno? I also place an open grocery bag next to me to discard of anything that doesn't belong on or in the chicken, aka the icky stuff. Start by removing the plastic covering from the chicken. Remember that icky part I was talking about, well...here it is. Now it's time to remove all of the padding and wrapping that happens to be on the chicken. This could be string wrapped around the legs, or paper stuck to the bird. Remove it all and throw it away. I use the claws for this that way I don't have to use my hands. Now we are going to trim some fat. This part is not necessary, but I prefer to do it. Some chickens already have the fat removed, and some don't. Take your scissors and cut away. Another thing that scares me are feathers. If you spot some on your bird you are going to have to pluck them. Next, pat the chicken until it's completely dry to get it ready for seasoning. Take some olive oil and drizzle it all over the chicken. Rub the olive oil into every crease and crevice, inside and out. Afterwards, liberally sprinkle salt and pepper onto the chicken. Rub it into the chicken and make sure you coat the entire bird. You can also rub fresh herbs, honey, citrus, etc. onto the bird, but I love doing it with just S &P because it's easy and I have all the ingredients on hand. Next chop up some veggies of choice. I always do onion and some garlic, but today I added some chopped carrots, sweet potatoes, and bell peppers. Drizzle the veggies with a little olive oil and salt and pepper. 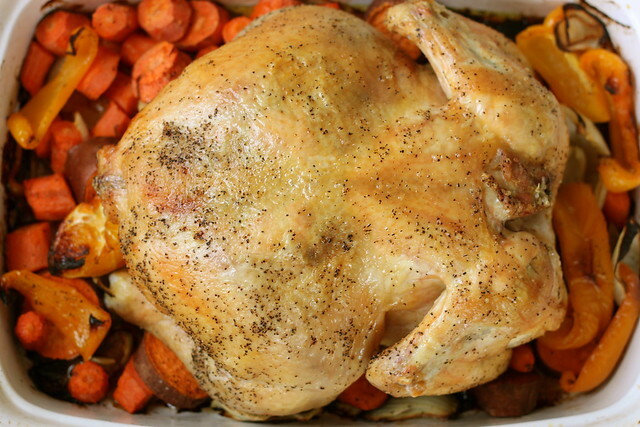 Spread the veggies on the bottoms of a roasting pan, and leave a little space in the middle for the chicken, and place the chicken on top of the veggies. This next step is optional, but you can place onions, garlic, lemons, oranges, apples, etc. inside the bird. 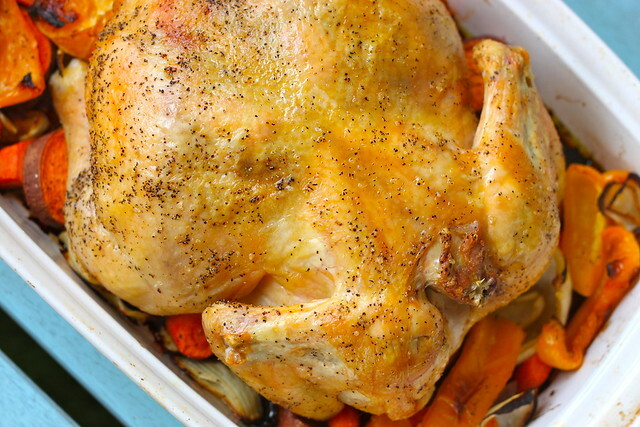 Place chicken in the oven and bake for 75-90 minutes (for a 5-6 pound bird.) I've had a chicken cook fully in 75 minutes, and some cook at 90 minutes, it all just depends on the chicken. You know the chicken is done when you cut into it and the juices run clear. Let the chicken rest for at least 15-20 minutes before cutting, so everything sets. Probably the hardest part for me about roasting a chicken is cutting it afterwards. I usually make my husband do it, because when I do it, I make a huge mess and it's never pretty. Thank goodness my husband can stop complaining that his jaw hurts after chewing my chicken dinner, and now can focus on more worthy complaints.